Let our beautiful Sterling Silver Orange Ribbon Earrings accent your attire while making those around you aware of cancers and diseases. Each set of Orange Awareness Ribbon Earrings is great for symbolizing your support and gives encouragement to people and families battling with their condition. Orange is used to spread awareness of Multiple Sclerosis and Leukemia. This Multiple Sclerosis Jewelry is made of genuine .925 sterling silver. These awareness ribbon sterling silver earrings are hoop earrings and measure about 0.40” tall and 0.14” wide. I bought these for me.. I love them! The closure is that strong. Still nice to complete the outfit. This was also a birthday present for a friend with RSD and she loves them. I thought it was a great present for her. 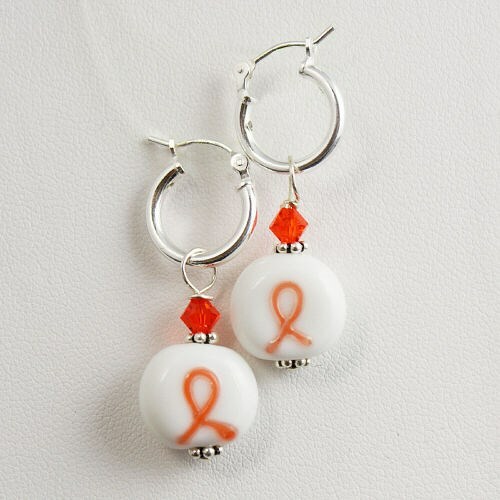 Additional Info These Orange Awareness Ribbon Earrings are great for showing your support. Wear these Sterling Silver Earrings to help spread the awareness of Cancer & Diseases. Shop MyWalkGear.com for your Awareness Gear today to help those you know and love living with any condition. Orange is great for spreading MS Awareness and Leukemia Awareness.